Four years in war; for four years we have been worrying about our sisters and brothers living in Transcarpathia (a region that used to be a part of the old Hungarian state). The new law on education, and other discriminative legislation toward minorities, has made the situation even harder during this period. Even in this difficult situation, 106 Reformed congregations are waiting for believers every Sunday. We visited the town of Bátyú, situated on the border of the three counties of Munkács, Ungvár and Beregszász, for a discussion with Rev. Géza Kacsó, the pastor of the local Reformed community about the congregation and the current situation in the region. “This community has seen better days; in the 1970s we counted 2400 members, and today it is half of that number,” said Rev. Géza Kacsó, who has been serving in Bátyú for 6 years. He explained that during the last century Ukrainians settled in the town to the lack of manpower; however half of the 3400 inhabitants of the town is still Hungarian. Among them, Reformed families, Greek Catholic, Roman Catholic, Eastern Orthodox, Jehovah’s witnesses and Baptist families live in the town as well. 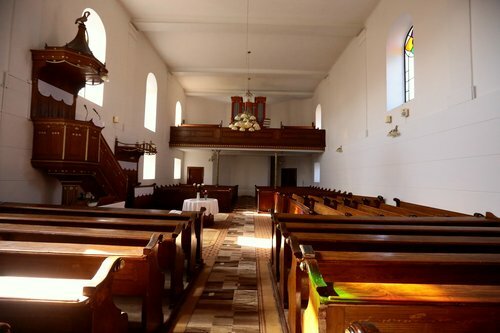 The congregation’s church building is 108 years old, the previous building burned down, and the new building was built in 1910 from donations and common effort from the townspeople. For example, the people from Bátyú, who had been working in America at that time, had also sent money to support the construction of the new building. “The history of the church reflects the story of the Hungarians in the 20th Century: It was necessary to take out a loan from a local Hungarian bank, which they paid back. 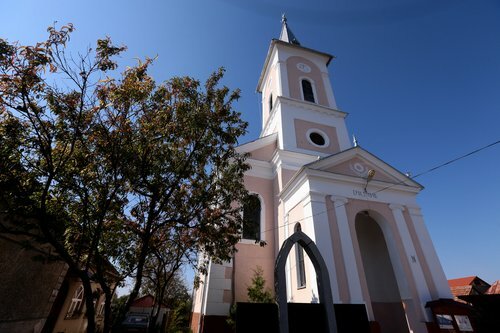 After the Treaty of Trianon (during which this region became part of Czechoslovakia), the now Czechoslovakian bank demanded that the loan be paid, although the people of the town could prove, with invoices, that the loan had been paid,” explained the pastor. Today, on Sundays, 120 congregation members attend worship, and of those members, almost twenty are children for which they organize two weeks in the summer for events. The congregation has a choir and an orchestra serving during church events and celebrations. 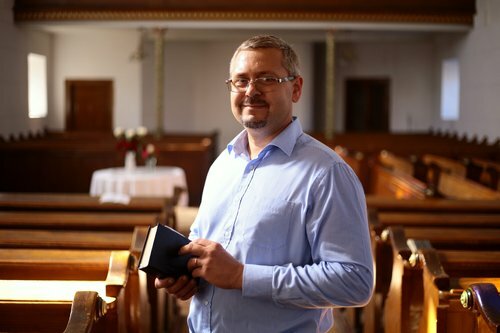 According to the pastor, the most frequently attended programs of the congregation are at-home bible study groups and children’s programs before the holidays which are run by three Religious Education teachers. “When it gets too cold, we have long winter breaks, sometimes up to a month long, because the school doesn’t have money for heating,” shared Rev. Géza Kacsó, “because we heat the parish, we organize programs for the children there so they don’t have to stay at home alone. One year, we had almost sixty children visiting us every day.” The pastor emphasized that Hungarians and Ukrainians live in peace in the city, for instance, the mayor is Ukrainian and his daughter regularly visits the Reformed choir. “Drafts are no longer being sent out, but compulsory military enlistment is reintroduced and our youth is dealing with great difficulties marching to war among Ukrainians,” answered Rev. Géza Kacsó to the question of the situation in Ukraine. In parallel, the effects of the economic crisis are serious: the once stable hryvnia is fluctuating, and those who have loans in foreign currencies are now heavily in debt. Meanwhile, the prices are getting higher, and payments and pensions stagnate – single pensioners are hit the hardest. “Many have fled abroad, and the dual citizenship (Hungarian and Ukrainian) helps as a union passport can be requested. But this possibility is a difficult as well, because without it, people would stay here – though I don’t how they could make their living here,” summed the pastor on the great dilemma of the recent years. Usually the men leave first, and after creating sufficient living conditions, their families follow them. “I know about ten families from our Reformed community who chose to live abroad. Parents and children leave, and the grandparents are left alone,” shared Rev. Géza Kacsó, “However the emigrants will return for the holidays and summer, but those attending western schools won’t return.” The pros of Bátyú being in this region, is that it is located at a railway junction that secures work for the locals, but still, many choose foreign opportunities. Legislations, like the planned education law which endangers the Hungarian language, are part of their decision making. After finishing his theological studies, he served for five years in Transcarpathia, after which he worked near Canterbury as pastor where he mostly had contact with Eastern-European migrants. He was able to personally experience life in another country, but he still wanted to go home. “I read Chapter 42 of Isaiah, the Lord invites and they are waiting on the island. This popped into my head in England, and I had never thought that this call could be more concrete. But I know that I am in my place at home,” the pastor told us.